A miscellaneous late-night search for "daylilies toronto" found a guy practically right around the corner from here who sells daylilies, mostly mail-order, from three locations in the GTA. 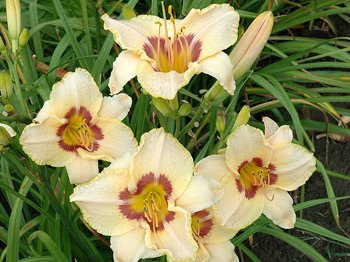 His operation is called Arcadian Daylilies, and it seems to be run in the most wonderful, professional manner. Most of the daylilies are in 2 gallon containers. He's developed a special technique for overwintering them in containers, which is apparently not easy to do, as they don't deal well with repeated freeze/thaw cycles. Some are in the ground, and some, mostly leftovers, missing-label and discontinued plants, are in 1-gallon containers, which he sells off for an amazing $5. When I heard 1-gallon, I wasn't expecting much, but these are actually nice, big pots, quite deep, with well-grown, obviously healthy clumps with 3-5 fans. Especially compared to the almost $7 I spent at Home Depot for a one called Night Beacon. Those (I bought 2 packages) were basically 3 straggly bare roots dying neglectedly in a bag. I hope they rebound, but experience with Home Depot has taught me not to hope for too much. Description: Blooming around peak season this flower has worked great en masse. The pale straw yellow is accented by a deep raspberry eyezone. A favorite. Excellent increaser. Tech specs: Height is 26 inches with 5 inch bloom. Mid Season Bloom, Dormant, Tetraploid. Description: Red Bitone With Cream Halo. 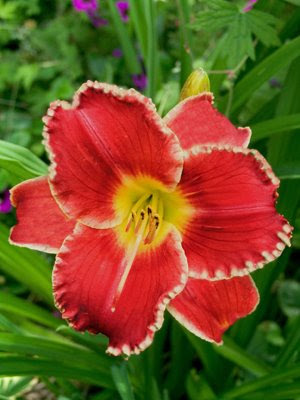 Startle is its name for a reason - a stunning five inch velvety red flower outlined with a ruffled ivory edge. Description: Contrasting light and dark come together in this popular variety. 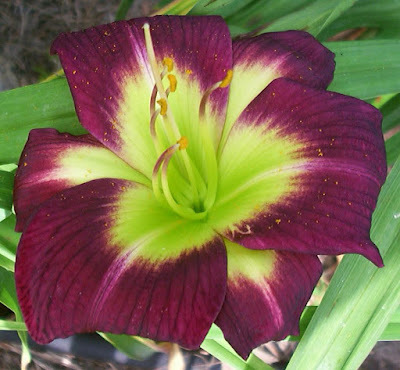 Blooms are a pale cream with a deep purple eyezone. Very attractive. Fragrant. 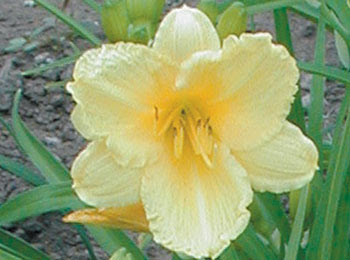 Daylily descriptions get so complicated. I don't want to get all wrapped up in the terminology of it...my criteria were mostly "not yellow or orange, medium height." These all look like they fit the bill! Planted all three in the back bed - Gay Cravat at the back corner where I took out the Astrantia, the startles on either "arm" of the L-shaped bed and Pandora's Box in the foreground. Should be lots of yummy daylily action back there come July! Description: Black purple flowers, large chartreuse center with a green throat. Spectacular contrast of colour. Diam: 10,5 cm. ( 4"). (Hansen'88) Dipl. Glad I've got a couple of rebloomers in this lot, anyway!